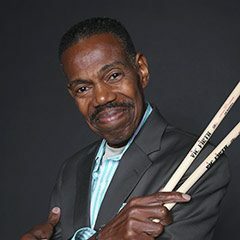 In September, world-renowned drummer and USC Thornton faculty member Leon “Ndugu” Chancler, who passed away last Spring, was honored at the 37th annual Watts Towers Day of the Drum Festival at the Watts Towers Arts Center. The day-long event featured a taiko drumming ensemble, percussion artists of all styles, members of the Locke High School band, with whom Chancler performed as a teenager, and a video tribute to the artist. Chancler, who is best known for his performances on Michael Jackson’s “Billie Jean” and “Bad,” had served as an emcee for the festival in past years. Immediately following the Drum Festival, the Simon Rodia Watts Towers Jazz Festival also paid tribute to Chancler’s memory with performances by Karen Briggs, Maiya Sykes, Nedra Wheeler, Reggie Hamilton, and USC Thornton Popular Music chair Patrice Rushen.